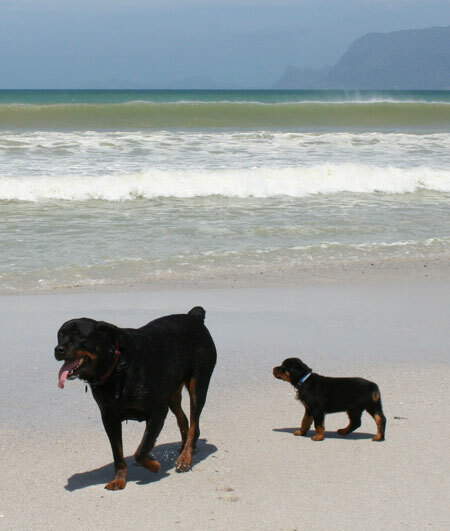 Today we are going to the beach with Mom’s friend and his dog, Ox (fully grown Rottweiler). I hope Ox is nicer to me today – he usually just ignores me and steals my toys. And he doesn’t give them back! He bit the head off my funky chicken and now he won’t give it back to me :(. My Mommy says she will get me a new funky chicken! This is a photo of me and Ox at Muizenberg beach when I was 8 weeks old! 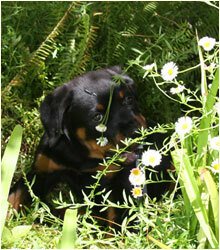 I’m much bigger now of course (3 months old next week).